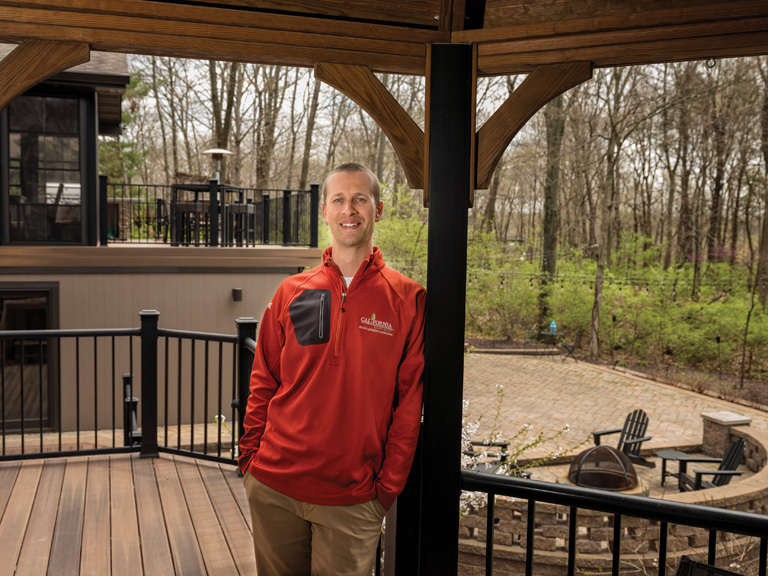 Mike Brueggenjohann, consultant at California Custom Decks, shares tips for creating the ultimate outdoor living experience. Mike: Solutions vary based on the desired functions spaces need to accommodate, but often you’ll find objectives including a cooking area, dining area and leisure area, if space allows. While a deck or patio surface is the starting point, railing also provides definition, stairs provide accessibility and interest and overhead structures provide a third-dimension that also can act as ever important shade and protection from the elements. SLHL: How do you go about mixing decking and hardscapes? SLHL: What are ways a homeowner can get relief from the sun? Mike: Shade solutions are an extremely important and popular element in project planning. Depending on the location of the home and surrounding vegetation, a structure providing relief from the sun can be the difference between using your outdoor space or not during the hot summer months. Gazebos, pavilions, pergolas and roofs alone or as part of a screen room or three-season room can be incorporated into an outdoor space effectively in most cases. SLHL: How can a homeowner personalize an outdoor living project? Mike: Personalization comes in the form of lighting (the jewelry of an outdoor space), colorful furniture, intricate flooring designs and patterns, the mixing of colors selected in building products and the addition of third-dimensional overhead structures that allow for shade and colorful plants to be incorporated into the décor. SLHL: What are the most current design elements in outdoor spaces? Mike: Roofs, pergolas and fireplaces are very popular features to build outdoor spaces around as these define the type of uses and times of year in which a space may be utilized. Because of the desire for near year-round use and more extensive use in gatherings, we are finding these features more popular than ever. SLHL: What are the advantages and disadvantages of real wood decking vs. synthetic decking? Mike: Wood decking offers the nostalgia of a rustic outdoor space and is preferred by some for its appearance and character. Synthetics have become more popular with our customer base because of the ease of care and very low maintenance. As the appearances have become very attractive and even similar to wood, there’s a lot of appeal in the synthetic choices for our climate. SLHL: If you are small on space, what is your best solution? Mike: Consider your outdoor space as though it is a room you utilize and furnish inside your home. If you can eliminate stairs and maximize efficiency in typical room-size ratios, you’ll be able to accommodate basic outdoor needs. SLHL: How large should a deck be in comparison to your home and acreage? Mike: While every home is different, many contain the same kinds of rooms that have fairly specific purposes that many people want to mimic in their outdoor space. Kitchen, dining and family room spaces are common to carry over to the outdoors, and these spaces may mirror the corresponding rooms inside the home.